If you do anything on the internet you’ve probably noticed that everyone seems to be updating their privacy policies at the moment. The reason for this is a handful of letters that have been causing major stress for businesses all across Europe: GDPR. So what is it and, as an author, do you need to worry about GDPR? The answer to the second question is maybe. GDPR, or General Data Protection Regulation, is a new set of legislation about how personal data can be stored and used for people in Europe. It doesn’t matter if you’re somewhere else in the world, if you store data about European citizens, GDPR applies to you. So if you have a mailing list containing names and email addresses and at least one of the people on your list is in Europe, you’re storing personally identifiable data for European citizens and therefore you need to comply with GDPR. A lot of authors maintain mailing lists so you need to make sure that yours follows the new rules. Some of them you are probably following already, but some you might not be, so here are some of the key ones that are applicable in this situation. You can’t have an opt out approach to storing and using someone’s data. They have to specifically say that they are OK with you using their information. So if you have a form like the one below, where people have to enter their information and choose to sign up, that’s opt in. If you get their email address for another purpose and add them to their mailing list, that’s not. Your email address will be used to send you email updates. You can choose to receive notifications when I have a new book coming out or other publication news. You can also choose to receive (at most) weekly updates giving information on new books added to the queer reading list. You personal data will only be used for the purpose of sending you the notifications you have chosen. For example, a little while ago I exchanged some emails with another author about doing an interview with him on this blog. A couple of weeks later, I started receiving his monthly newsletter. I never said or did anything to sign up to that newsletter but I was put on it anyway. I could easily unsubscribe from it, but unsubscribing is a whole different issue. If you’re going to sign people up for a mailing list, you have to make sure that they have specifically and deliberately chosen to be signed up, whether by entering their email in a form or ticking a box to choose it if they’re giving you their email for some other purpose (and that box can’t be pre-ticked). If you’re going to be storing and using someone’s personal data, it has to be done in an informed way. You have to tell people what you’re going to use the data for and then only use it for that purpose. So if someone signs up specifically to receive news about new book releases written by you, you can’t also send that person information about your friend’s book. You may have noticed that my sign-up form has two distinct tick boxes. One is for my publication news, the other is about updates to the queer reading list. There have been plenty of people who have signed up to receive the (at most) weekly emails informing them about new book recommendations being added to the reading list, but they don’t sign up to receive my publication news. So if I get a short story accepted in a magazine, that means I can send that news only to people who have chosen to receive those updates, even though I have the list of email addresses for the other people. Be specific. Say what you’re going to use their information for and then only use it for that thing. I mentioned above that unsubscribing was another issue. You have to make it really easy for people to choose to stop receiving your updates and stop you storing their data. If you use a solution like Mail Chimp, this is actually done for you, but if you manage your own list without these tools, you need to ensure that there is a clear and easy way for people to take themselves off your mailing list. You should only store information that you need for the purpose you collected it. So for a mailing list, you need to store people’s email addresses. Maybe you want to store their first names as well so you can address the emails to people personally, but you probably don’t need to know their physical address, date of birth, eye colour, or anything like that. Store the minimal data you need to do the job. And you should only store the data for as long as you need it. So if someone unsubscribes from your mailing list, you should remove their information from your list. You shouldn’t keep a list of old email addresses from people who no longer what to receive your updates. This is where it gets tricky, because unless you’re a technology expert, you’re probably not highly involved in the technical security behind where your list is stored, so it’s hard to know how safe it is. The rules under GDPR are that you have to keep the data safe for unauthorised access, and you have to inform people if there’s a breach and their data gets stolen. There are a lot more specifics on the GDPR website, but this is where using a solution like Mail Chimp is really helpful because GDPR also applies to them. They have to hold their data securely – and their data includes your mailing list. They have to inform people about data breaches – which means they would have to tell you and the people on your mailing list, as well as the appropriate authorities. So while you are ultimately responsible for the data and have to follow these rules, working with a major company to manage your mailing list lets you breathe a little easier because that responsibility is at least partially shared. You don’t have to worry about the technical security side all by yourself. It is possible that your list may already be compliant. If you’ve always made sure that people opt-in to the mailing list and you’re clear about what you’re using the data for and only storing the necessary data and there’s a nice unsubscribe button, you’re already meeting the most relevant criteria. But it’s still a good idea to check your list. Clear out old data if you’re not sure how those people signed up and whether they were properly informed. Send an email asking people to confirm that they still want to receive your updates. Take this time to do a bit of spring cleaning of your mailing list. If you write short fiction or poetry, I want to share a wonderful resource with all of you: The Submission Grinder. This website stores a lot of information on a huge list of magazines, publishers, anthologies and writing contents, and it’s all searchable. There’s an advanced search page that lets you put in details about the story you’ve written, like its genre and its length, and the website will give you a list of places that accept submissions of that type. You can add a bunch of other qualifiers into your search – like whether the place accepts simultaneous submissions, whether it takes print or electronic submissions, or even what the minimum pay you’re interested in is. The website also stores information on how long it takes for various publications to respond to submissions and how many of those responses were rejections or acceptance. Each publication has graphs about this data so you can see visually how long you can probably expect to wait to hear back from the place you’re submitting to. You get access to the search capabilities without having to sign up, but if you do become a member, you can also use the site to track your own submission history (something I’ve previously been doing in Excel files). You can log in a submission every time you send a story out and track the response, adding to the massive pool of data that the story contains, as well as having a log for your own purposes so you know exactly where you’ve sent your work before. As you start entering this information, you begin to get a dashboard that shows you how many stories you’ve submitted and what the responses have been, which stories have done well or badly, and even how much you’ve been paid. While the submission tracking information is useful, this is stuff I’ve been doing for myself anyway, so this isn’t massively important to me personally, but the search capabilities are amazingly useful. This site is a brilliant resource if you’re trying to figure out where to submit your work. Enjoy, and best of luck with your story and fiction submissions. I had intended to post this yesterday, but then my home was out of power for the entire day due to a fault on the line. So there were technical difficulties in posting this message about technical difficulties. If you tried to log on to my site this time last week, you might have noticed a slight problem with it. And by “slight problem” I mean that the entire website had disappeared. Thankfully, I managed to get everything back and I didn’t lose any data. All my old posts are safe and sound. This shouldn’t happen again any time in the near future, so you can relax and enjoy the reviews, recommendations, and writing talk, and I can stop fretting about whether or not Skynet is trying to eat my blog. The good thing is that the data for the queer reading list is stored elsewhere, so even if I had lost the site, it would have been possible to resurrect the reading list, this just meant that the page was down for a bit. This technical… hiccup… did mean that I didn’t do the queer reading list update last weekend. That wasn’t actually an issue because there have been no suggestions for new books over the past couple of weeks. Don’t forget that I’m doing a giveaway all through 2018 and you can win a free book by recommending new books to go on the reading list. Despite there being no books to add, the reading list is still getting an update this week. I’ve made a number of changes to the layout and interface. Most of these changes are specifically in two areas: navigation buttons and filters. You can still navigate the list by clicking on the arrow buttons to move between pages, but I’ve also added some flag buttons that will let you navigate directly to the area you’re interested in. 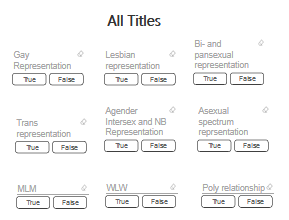 So if you’re interested in reading books with asexual, demi-sexual, or aromantic representation, you can still click on the navigation arrows until you reach page 6, or you can click on the ace pride flag button and skip straight there. I’ve put these navigation buttons on each page so you can jump around between pages as you wish. I’ve changed a few things about the filters on each page, with the most obvious being that I’ve changed them to buttons rather than a list with tick boxes. This should make it easier to apply filters. I’ve done some resizing and moving around of these buttons on most of the pages to try and make the filters a little less cramped. They’re still crammed in together on the Agender, Genderqueer, Intersex, and Non-Binary page, but there should be less overlap between filter boxes which again should make it easier to select the filters that you’re interested in. One minor change around these is that I’ve switched the order of the filter buttons for each category so that True now comes before False on all of these buttons. Hopefully this will improve the usability of the list. To further assist with this, I have added alt text descriptions to elements on the views to try and improve this list from an accessibility point of view but unfortunately there were some changes I wasn’t able to do. I was asked about making the scrolling bar wider but unfortunately this isn’t a setting I’m able to control. I have suggested it to the company whose software I’m using to make the list that they might want to make this an adjustable settings, especially for accessibility reasons, but I can’t do much about it unless they decide to listen to that feedback. If you are struggling to use the list for accessibility reasons, let me know and I might be able to give you access to the back end data behind the list. That wouldn’t give you the same ability to filter all the settings, but if there’s a particular sort of representation you’re interested in (e.g. lesbian representation) I could create a pre-filtered view on the back end data and that might be easier to consume if you use a screenreader. If there are other aspects to the list causing accessibility issues, let me know and I’ll see what I can do.